You know what my favorite type of craft project is? A simple one. One that I can do while my little one naps in the afternoon. Nap time crafts are the best because I get so much done! And my latest craft project was so simple that I got it done within the first half hour of nap time, score. 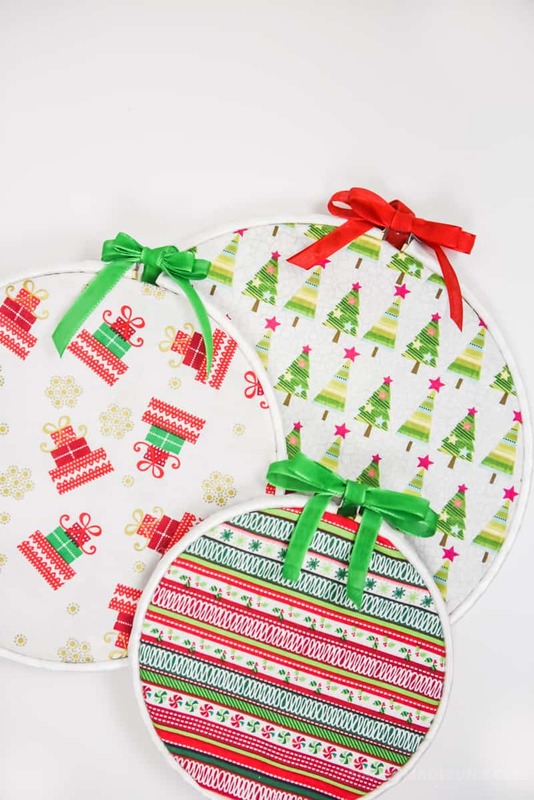 If you love Christmas crafts you will absolutely love these easy fabric ornaments! You don’t even need to sew to be able to make them. Just grab your favorite fabric (you can even use scrap fabric! 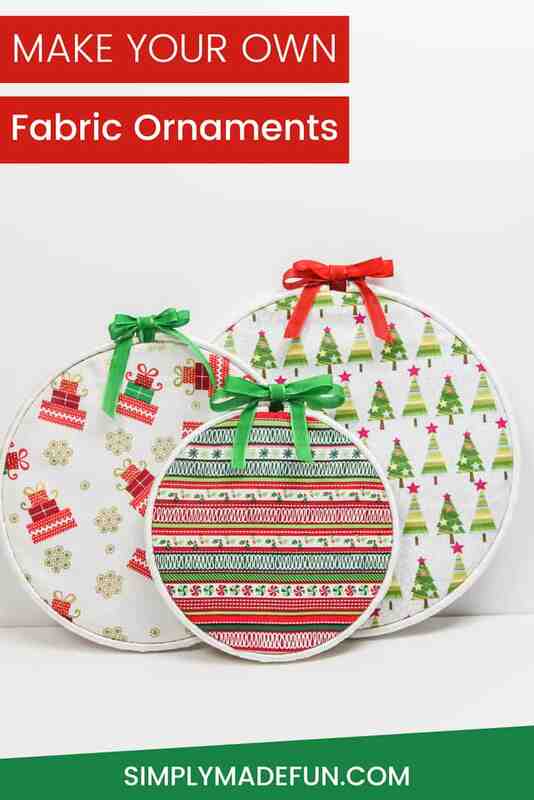 ), hot glue gun, and embroidery hoops to create the cutest Fabric Ornaments for your home! Christmas is my absolute favorite time of year. Most of the time I go straight from Halloween to Christmas (sorry Thanksgiving) because I can’t wait to decorate my home in a winter wonderland. Christmas music is on every day, we bake cookies a lot, and Elf is a weekly movie-night staple around here. I just can’t help it, Christmas is awesome. Last year I didn’t decorate as much because I was just too tired to get around to it. With a (then) two month old we weren’t getting much sleep and he was pretty much cluster feeding all the time. I had absolutely no energy to put up our big tree, fluff out the branches, or hang our bulbs. And Chris, who could care less about that type of stuff, wasn’t going to do it either. So we kind of grinched it up last year. Right now I’m all about decorating and I’ve decided that we’re doing baby-friendly decorations this year. Because I keep having nightmares that the baby will accidentally pull the tree down on himself or hit one of the glass bulbs and it’ll shatter and cut him up. Needless to say I’ve pretty much scarred myself and am being extra cautious this year. And that’s how I came up with these Fabric Ornaments. They’re baby-friendly and super cute! Want to make your own Fabric Ornaments? Here’s how! I highly suggest putting on a Christmas movie and crafting in front of the tv for this project. Let’s get in the Christmas spirit! If you want to cover your embroidery hoop, you can wrap ribbon around them (like I did) or spray paint them (a much faster way of doing things!). 1. 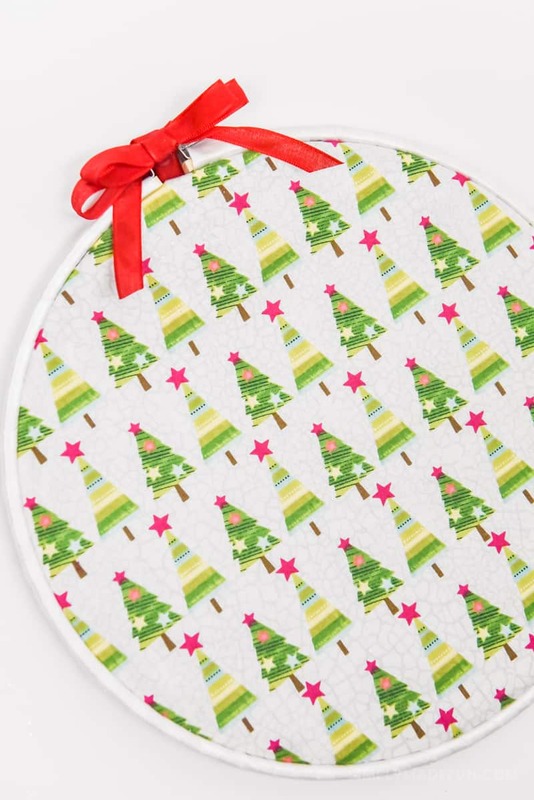 Grab your piece of fabric, the inside of your embroidery hoop, and hot glue gun. Wrap your fabric around the inner hoop and then place the bigger hoop on top of the fabric. Make sure you close the top hoop (make it tight) and then pull your fabric so that it is tight between the two hoops. 2. Cut off most of the extra fabric around your hoop. Don’t cut off too much though! You want to make sure that you have enough to glue to the back of your hoop. 3. Heat up your hot glue gun and glue the extra fabric to the back of your hoop. Make sure you’re careful and don’t burn your fingers! I’m pretty sure I don’t have fingerprints anymore on my pointer fingers…. 4. Cut a small piece of ribbon and loop it through the metal piece on the top of your hoop. If you want to add bells to your ornaments, now is the time to do it! 5. I hot glued the ribbon to the metal on the hoop so that it wouldn’t move around too much. Then I made a small bow and glued it to the first piece of ribbon. 6. Once you’re finished you can either hang them on the wall or even put them on a shelf. I haven’t quite decided where I’m going to put mine, but I really haven’t pulled out all of my Christmas decorations yet so I’m going to hold off on displaying them. I can’t wait! These Fabric Ornaments were so simple to make and I love how they came out! I’m kind of obsessed with the fabric patterns too. It was my first time mixing multiple patterns and I’m pretty proud of that. It wasn’t as daunting as I thought it would be and now I have a nice pop of color that’ll go well with my white walls! These are so so cute! You’re making me want to get to work on my Christmas crafts and my decorating. I’m hoping I can convince Tyler that our tree needs to go up this weekend!